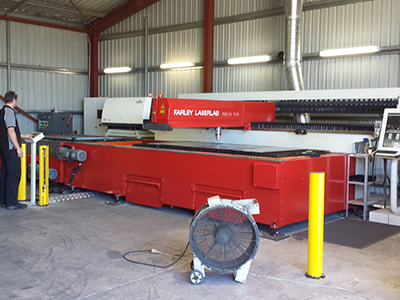 Farley LaserLab Australia has some of the best Technicians in Australia employing 4 full time service technicians and 3 engineers to help out our customers when in need. Our Australian technicians & engineers are involved in the manufacturing, assembling, installing and commissioning of each machine that goes out to our Australian customers, so they know your machine better than anyone else and will be the best people to talk to when you are in need of a quick fix. So if you get a Farley LaserLab Machine make sure you contact a Farley Technician to make sure your machine runs smoothly. On top of this we have many more technicians to help us from around the world be it our team in China or the US but also from Hypertherm's Technical Team that will only help out official O.E.M Channel partners and not resellers. Meaning you get the best service from the Farley Team any time you need it. Also make sure when you are dealing with a Farley Machine you deal with Farley Technicians for the best possible service, too many people in the past have tried to save a dollar by hiring people who have worked with Farley Machines 15+ years ago and do not understand the changes in technology that have been made, and this all ends up costing you triple the amount that you thought you were saving, due to firstly others taking 2 - 3 times longer to finish the job and then us having to fix up the job afterwards. 1. Qualified Farley Engineers and Technicians who are involved in the manufacturing, assembling, installing & commissioning stages of each of Farley's Machines. 2. Quick Service Times, they know all parts of Farley Machines, so problem solving is much quicker, no fumbling around working out how things work. 3. Farley Engineering & Drawings - Every component of Farley Machines has drawings, part numbers and databases of suppliers, which will again mean quick problem solving. 4. Farley Engineers who have designed each component on the Farley Machine, so when you are in need of quick help and have capable employees then you just need to give our engineers a call for phone support, which is free to our account customers. Farley LaserLab Australia Technical Team. We charge a rate of $150.00 + GST per hour for our work, and others may charge you less per hour to do the job, though do you ever ask how long this job is going to take? Because with our team of qualified and educated technicians and engineers we are significantly faster, so your 8 hour job that you paid to get other companies 'who say' they can work on our Farley Machine can be completed in an hour with our Technicians who are involved in the manufacturing of the machine. So save yourself the time and the money and make sure you get a Farley LaserLab Technician to help you out with your next service.